This post follows on from last week. I decided I couldn't adequately describe tiny birds of about 150mm (6 inches) - such as Stints - and birds at least 10 times their size - Pelicans. 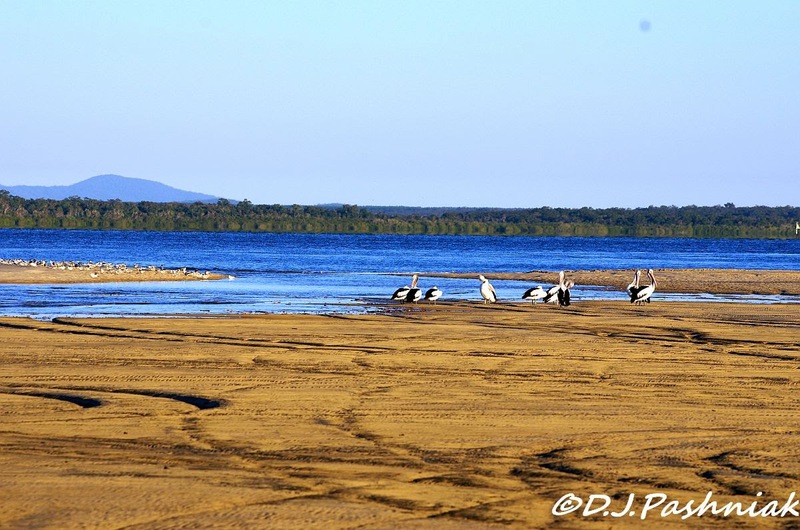 As I walked out onto the sand at the point I saw a group of pelicans and Terns right out on the end. I looked over towards the sand island to see if there were large numbers of birds over there but again I saw mainly Pelicans at one end. The Terns out at the end of the point were mainly Crested Terns looking rather scruffy in their non-breeding plumage. 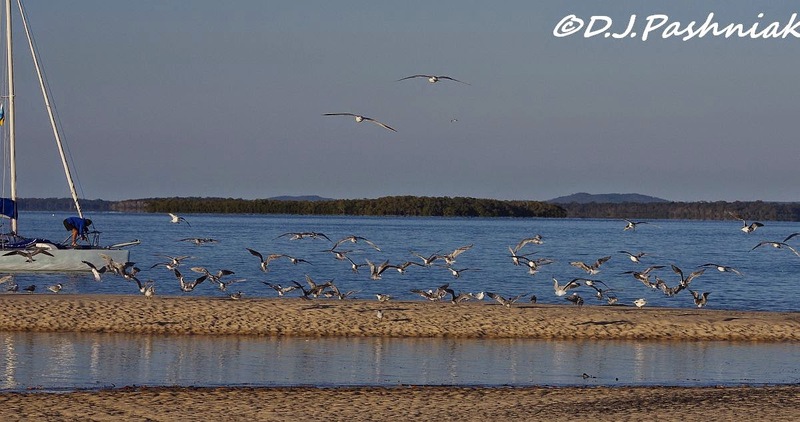 In this photo there is one Gull-billed Tern on the left and a Silver Gull in the rear at the right. As well as the Crested Terns this photo has a Caspian Tern in the center (with the red bill) some Pied Cormorants, and more Silver Gulls. The Gull on the left next to the Cormorant is a juvenile still showing brown flecks on the plumage. Suddenly all the Terns took flight - then slowly settled down again. At first I thought they had been frightened by the sail boat which was beginning to move from where it had anchored over-night. However, when I looked further to the left I saw that the Pelicans had been disturbed by the rising tide. They had decided to move out to the little sand island where the Terns had been roosting. A bird of this size coming in to share your space means you must move! 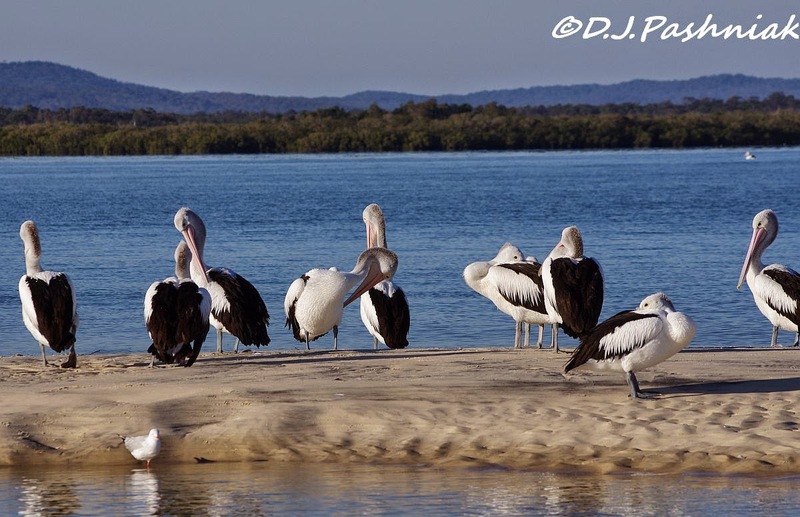 Eventually the pelicans occupied all of one end of the little island. just awesome water birds and shore scene. nothing i get here. I agree with Tex, awesome water birds they are indeed!! I enjoyed seeing them almost every day when I lived in Seattle, but here in Portland, Oregon, I'm too far inland to see many of them any longer. I do miss them!! Your wonderful captures are the next best thing, Mick!! Thank you for sharing and for visiting my blog!! Always appreciated! Have a great week! I love the shorebirds and the Pelicans.. 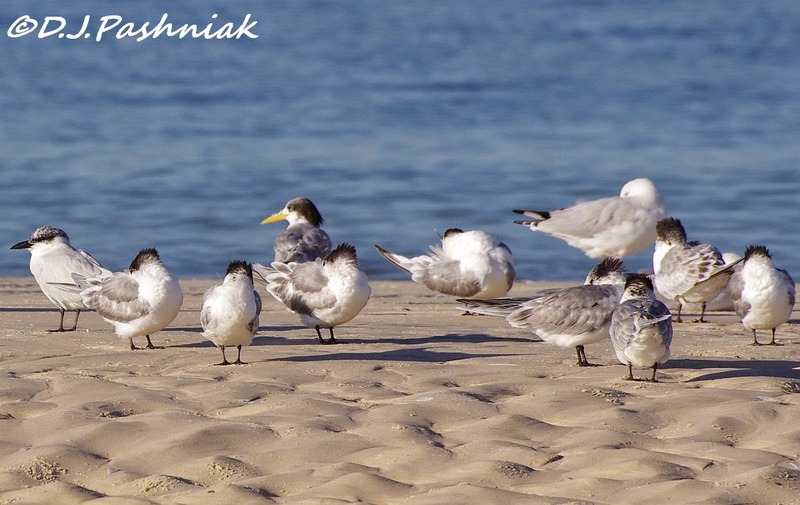 The Terns are some of my favorites.. Great captures, thanks for sharing. Have a happy week! The pelicans are huge birds no wonder the others keep their distance. What a wonderful place and good fot us that you took such nice pictures! HI Mick Such wonderful photographs of both the Pelicans, Cormorants and the Terns. Bring back happy memories of when I saw them in Australia. Your detail images certainly make IDing the Terns much easier. Great post Mick. The pelicans are handome birds. I would move too if I saw them heading my way. Such a picturesque area Mick. 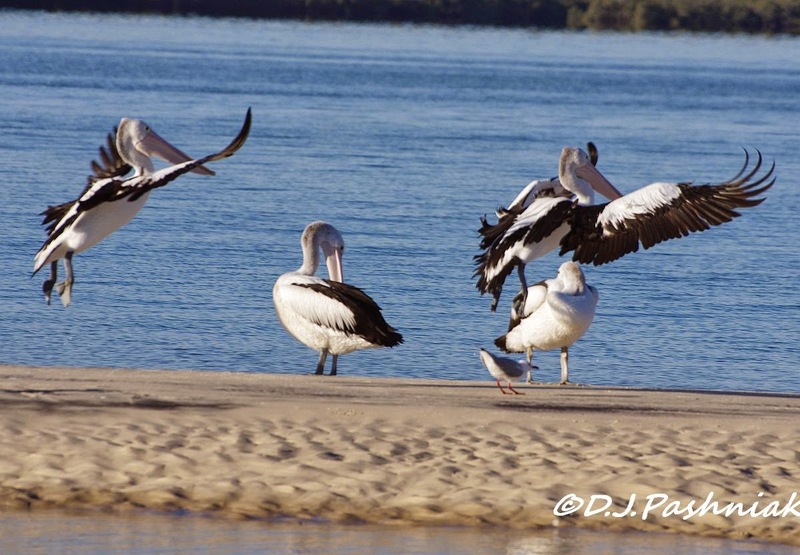 Wonderful shots, love those pelicans! Speaking of last week's stints, a Red-necked Stint showed up in the Florida Keys and was still there this morning, the first ever seen in Florida. Great photos as usual! 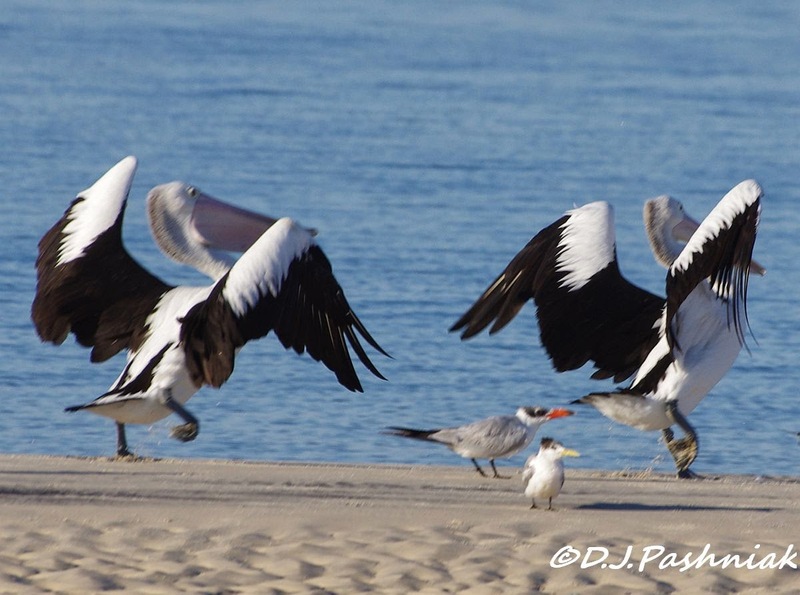 A wonderful series of photos, the two Pelicans looks like synchronized. You certainly have to do lots of your birding at long distance Mick. Seeing those terns and pelicans together like that makes it easier to appreciate the difference in size. Great pics as ever. Great series and this makes me think that I need to take a journey to the seashore. We always head West and nothing like this out there...however there is beauty! 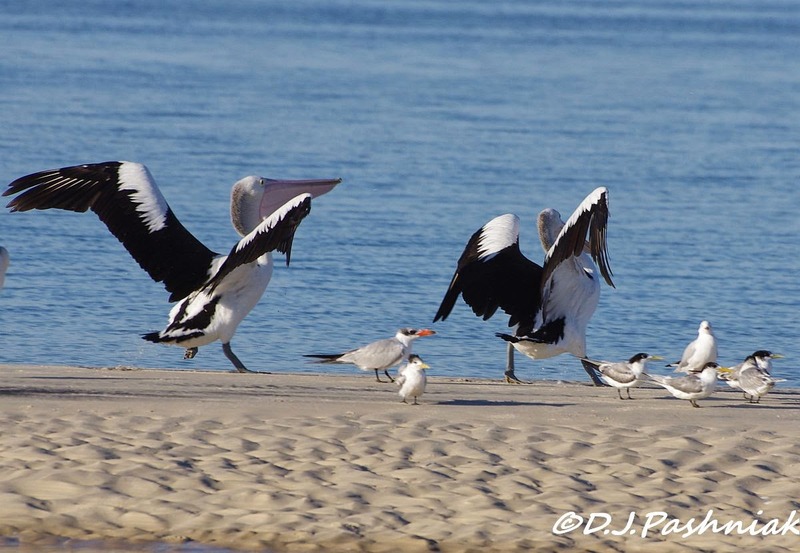 Great pictures, love the pelicans doing an aerial ballet! Great shots of birds in a beautiful setting. Your shots are always fascinating as I don't get to see many different birds here in NZ. Fun series of photos. Obviously the pelicans are the dominant birds there. Here we often see a variety of birds on spits and wharves getting along together well. Really great series of photos. Love the landing pelican shots! Really like those Crested Terns. Nice set of pictures - always good to have a look around when birds flush for no apparent reason - often means a bird of prey is about. Beautiful shots of these birds! Love the pelicans. What wonderful photos! I love all the pretty coloring even if they are just black and white. I love the contrasts and all of the birds. Pelicans are such clowns. We're traveling and I'm catching up. Grateful to Feedly that lets me know what I've missed on my favorite sites.